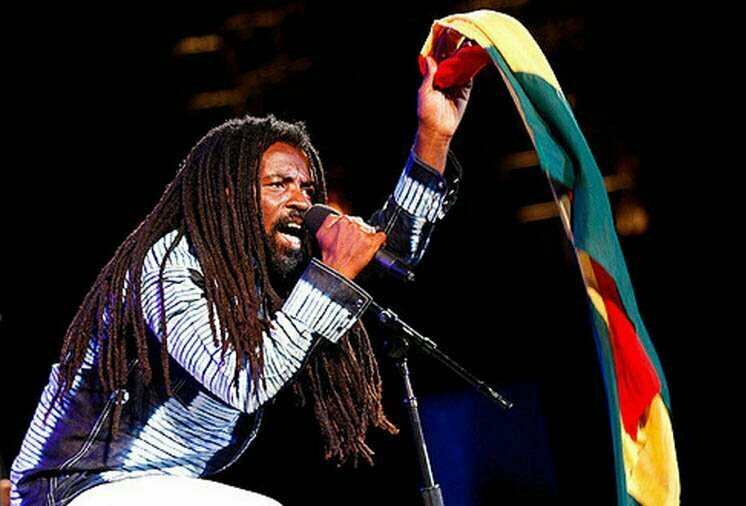 Rocky Dawuni Rocks Grand Performances + European Tour Dates! Rocky Dawuni & the Revelation Project put on two spectaculars shows to open the Grand Performances’ season at the California Plaza on Friday, July 10, 2009! The noon show had a full lunch time crowd with many families and fans coming over from work in downtown LA. The night time show with guest MC Rai featured a capacity crowd on the plaza which was estimated to be over 4000 strong! The Afro Roots Reggae Star pulled out all of the stops for both shows with a 12 piece strong band featuring musicians from all over Africa and the Diaspora. Rocky invited legendary guests from many genres of music to sit in with him including South African superstar, known as “The Voice,” Vusi Mahlasela, who joined Rocky on his brand new anthem “African Reggae Fever” from his upcoming release “Hymns for the Rebel Soul.” Up next was Grammy award winning Blues guitarist Keb Mo, who took over on guitar for an extended jam. Indie favorite, Tom Freund, joined Rocky on ukulele for crowd favorite “Jerusalem.” Tom, who’s new album was produced by Ben Harper, first met Rocky earlier this year when they shared the stage at the Balispirit Festival and are currently working on a track together! The finale of the evening, “Afro Roots Vibration” saw legendary Jazz trumpeter, Ronnie Laws, join the band for an unbelievable rendition of Rocky’s classic that had the entire crowd dancing like there was no tomorrow! Immediately following the Grand Performances shows, Rocky took off for a European tour of Germany, Austria and beyond with legendary Ghanaian Reggae band Vitamin X! Rocky recently completed his forthcoming 5th studio album, “Hymns for the Rebel Soul” to be released in late 2009. This new 13 song album was inspired and written over the course of his travels around the world particularly Israel, Finland, Jamaica, U.S. and Ghana in his quest to articulate and craft a record that reflected the common spiritual, political and social aspirations of ordinary folks around the world. Rocky can also be seen/heard alongside Bono in the video and song remake of “War /No more Trouble” on the highly successful “Playing for Change: Songs Around the World” album. His voice can be heard on the theme song for brand new series, “The Goode Family” on primetime ABC Television. When not playing on some of the world’s largest festival stages, Rocky is involved with UNICEF, Product (RED), The Carter Center and The Global Fund and other pro-active humanitarian, social and environmental organizations including his own Africa LIVE! NGO in his belief and commitment to create positive and sustainable change.